Imagine what it's like the Sun's surface temperature even the sun's core up to trillions of degrees Celsius? Scientists working at the European Nuclear Research (CERN) in fact has recently succeeded in creating a temperature of 10 trillion degrees Celsius in the Earth. But do not imagine that temperature in an open free Rungan. Such high temperatures created in the reactor Large Hadron Collider (LHC), the giant instrument of high-energy particle accelerator, located on the border of France and Switzerland. This is part of research to understand the formation of the universe that is based on big bang theory. 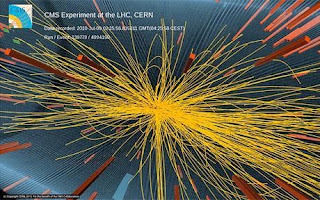 With the LHC, scientists from several institutions collaborated to do a study to create quark-gluons plasma, one might say a kind of mixture of sub-atomic particles (quarks and gluons) that melts as the temperature is very high. Plasma is made with high-speed crash tin ions simultaneously. 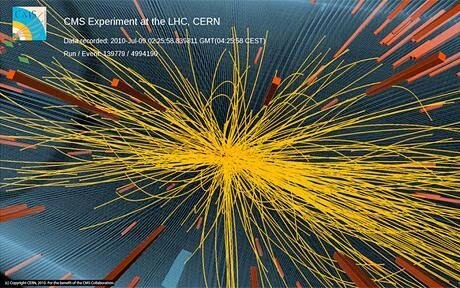 Shots that produces a phenomenon called "big bang" mini at the LHC. In a mini big bang, the ball-of-mass fireball high type and a temperature of about 10 trillion degrees Celsius is created. "At these temperatures, protons and electrons that make up atomic nuclei to melt and produce fire balls of mass type and high temperature plasma gluons called the quark," said David Evans, a researcher from the University of Birmingham who are involved in the mission. Research on the plasma is very important to understand about the expected plasma formed a millionth of a second after the Big Bang happened 13.7 billion years ago. Through this study, researchers also can learn more about the style of a "binding" of atomic nuclei and determine 98 percent of the mass of the body. Prior to the study of plasma using the LHC, quark-gluons plasma have also been studied using the Relativistic Heavy Ion Collider (RHIC) in Utah, New York, USA. However, researchers who publish their work on February 10, 1010 and had only managed to create plasma with a temperature 4 trillion degrees Celsius. During the coming week, researchers at CERN will still be trying to learn the results of experiments. After that, they will return to the mission of firing protons which also aims to understand the formation of the universe.